Bath have boosted their second-row options with the signing of Argentina's Ignacio Fernandez-Lobbe and USA Eagles captain John van der Giessen. Bath moved swiftly to secure the experienced duo on short-term contracts following injuries to Scott Hobson and Peter Short. Fernandez-Lobbe, the former Sale and Northampton lock, will be with the club for the rest of the season, while Van der Giessen has joined for a three-month period. Van der Giessen, who was without a club after parting company with Albi at the end of last season, was recommended to the club by former player Dan Lyle. Bath head coach Steve Meehan said: "Both players will be a valuable addition to the squad at this time when we have injuries in the second row. They are both experienced players, who have played in a variety of leagues, and have really good attitudes. "I'm sure they will fit right in with the squad we have here. Ignacio has played at the highest level for his country, and is a proven leader, so will be bringing some great experience with him, and John is a strong player, who has some very good lineout skills and is also athletic around the field." 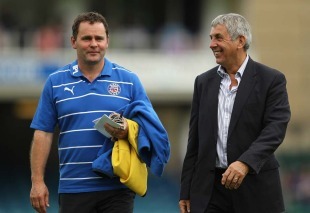 Earlier Bath chief executive Nick Blofeld revealed Lyle's role in Van der Giessen joining the club. Blofeld told The Chronicle: "It's a classic case of tapping into your network of contacts and past players. The coaches analysed John's play and thought he was worth it. He is athletic and good at the lineout. "He'll be here any day now. We want to get him registered with (Heineken Cup organisers) ERC. It's a three-month deal initially but we would love to keep him if we can." Meanwhile, Blofeld admitted that the continued absence of Hobson, who injured his arm during the pre-season clash with Pays d'Aix, is a cause for growing concern at the Recreation Ground. "We have issues with Scott Hobson - it's going to be months rather than weeks," he said. "It was one of those freak accidents where he must have been hit at just the wrong angle and it damaged his nerves. He can't lift his arm. It's a long-term thing. It's a worry."